JUSTIN’S PICK :: MARVEL NOW WHAT #1: Marvel Comics have a pretty decent track record of self-parody, from Not Brand Echh, to the wonderful send-ups by Fred Hembeck, on through to Chris G’s Mini Marvels. 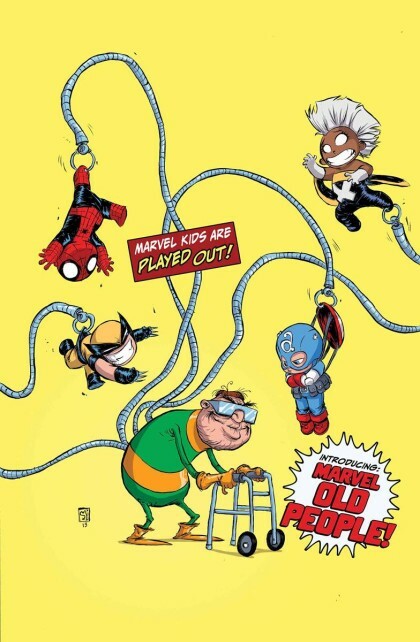 The tradition continues with Marvel Now What #1, an anthology guaranteed to tickle the McRibs of many-a Marvelite. The Skottie Young cover alone is worth the price of admission, but you can rest assured that the House of Ideas has plenty of yuks lurking in these pages. Now, can we just get a third series of Strange Tales? Please?